Ye Olde Dutch Kills in today’s eminently practicable post. 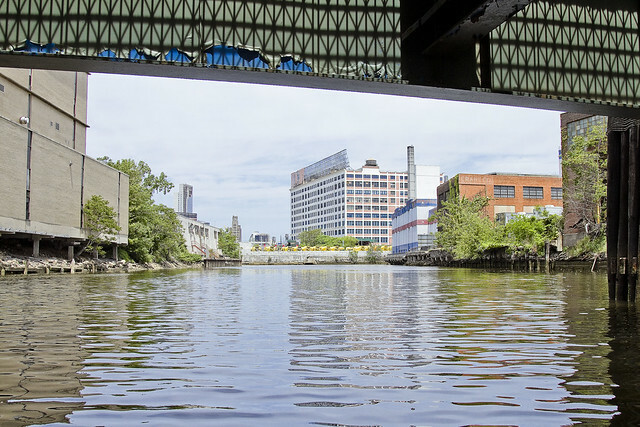 As mentioned in prior posts, one somehow found himself in a canoe on Newtown Creek’s Dutch Kills tributary a couple of weeks ago, recording the delivery of a floating dock by the HarborLab group to the waterways Turning Basin for the use of the faculty and students of LaGuardia Community College. The dock was paddled in by volunteers from HaborLab, and I was in a second canoe with a wonderful lady named Lynne Serpe. 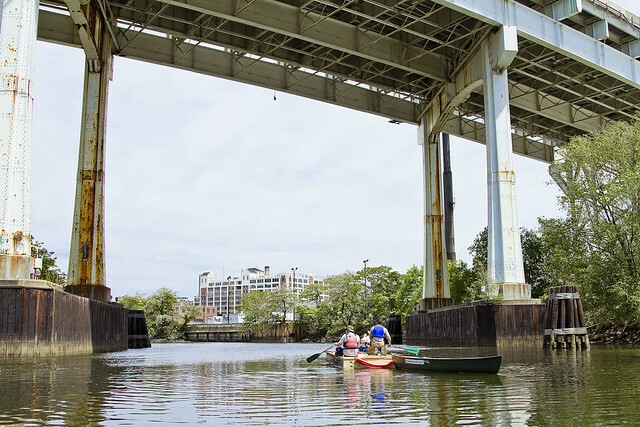 Water access to Dutch Kills is a rarity, so I took full advantage of the opportunity afforded. 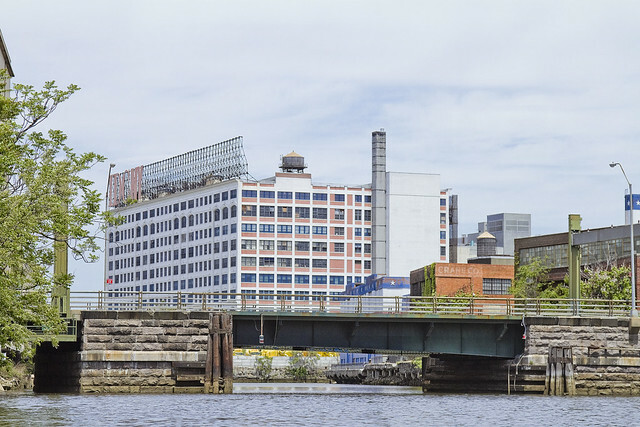 Hunters Point Avenue is a 1910 vintage single bascule bridge which provides the gateway to Dutch Kills’s Turning Basin. Like Borden Avenue, Hunters Point Avenue was originally a late 1860’s era plank road cut through a swampy morass, which is often referred to in the historic record as either the “sunken meadows” or “waste meadows.” These meadows were reviled by the paleo Queensicans as being a great breeder of biting insects and a factory for waterborne pathogens like Typhus, Cholera, and Malaria. Famously, a series of studies by an environmental contractor of the United States Army Corps of Engineers back int he late 1990’s also recorded the presence of Gonnorhea in these waters – which is just charming. There are combined sewer outfalls on either side of the bridge, which has created a serious amount of segmentation around its footings. These sediments are near the surface, and at low tide the water can be measured in inches rather than feet around the bridge. The sediments are referred to as “Black Mayonnaise” by scholar and activist alike and they are a combination of industrial runoff, historic petroleum and coal tar pollution, and human excrement. I did mention that I was in a freaking canoe, right? 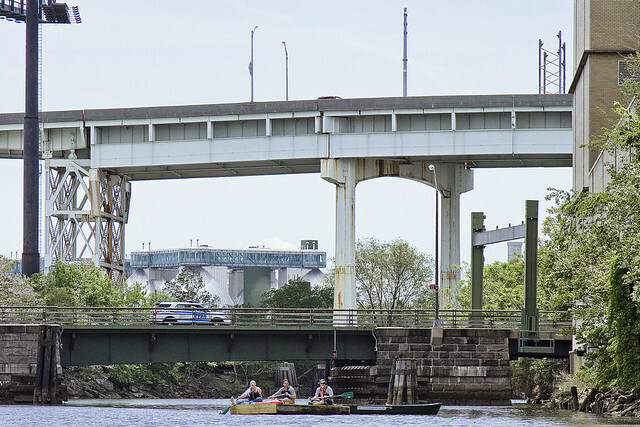 Passing under the draw bridge – and yes, I have seen it open – the Turning Basin of Dutch Kills comes into view. The large white building is the former Loose Wiles Thousand Windows Bakery, showpiece of the Degnon Terminal. It’s currently building C of the LaGuardia campus. The Dutch Kills Turning Basin, as the name suggests, was designed to allow articulated tug and barge combinations an area large enough to reverse direction, and back in the salad days of “America’s Workshop” there were barge to rail connections available at its terminus. Barges could unload cargo directly onto the rail cars of the Degnon Terminal Railway which also allowed siding access to Sunnyside Yards and the Long Island freight system. Looking south toward Hunters Point Avenue, the dock’s paddling crew were fighting a slight current. The low tide which allowed us to enter the canal by inching under the decrepit DB Cabin rail bridge was moving surface water back towards the main stem of Newtown Creek. It should be mentioned that this was a very weak sort of current, as the waters of Dutch Kills could be most accurately described as rising and falling in a vertical column with the tide rather than moving in and out in a lateral manner. 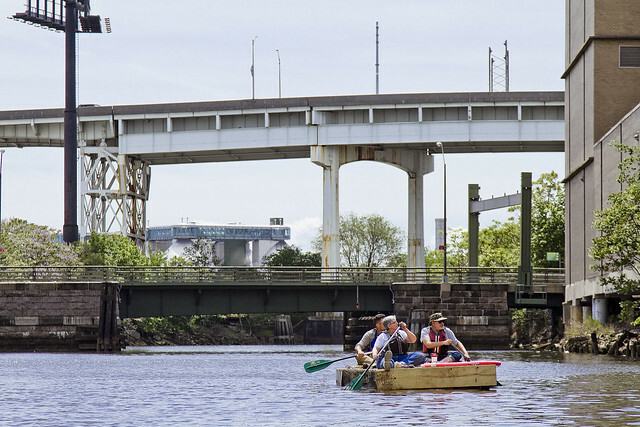 This tepid flow condition is a big part of the reason why the sedimentation along the waterway is so pronounced, and why the water quality is as horrible as it is. 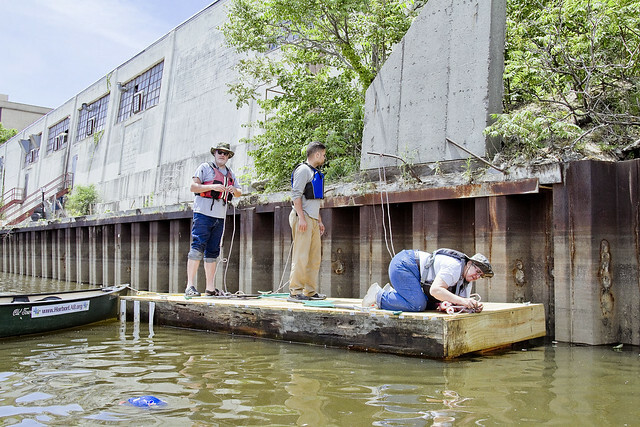 Regardless of current or sedimentation, the stout limbs of the HarborLab triad managed to guide the decidedly non hydrodynamic floating dock towards its destination along the western bulkheads of Dutch Kills. 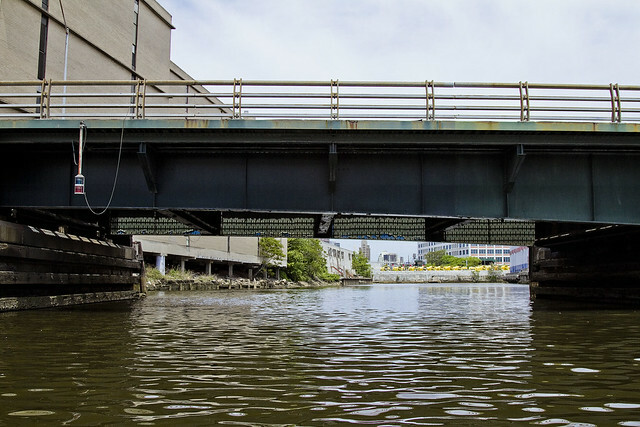 The owner of these bulkheads is cooperating with LaGuardia Communty College in its studies of the waterways. The property is occupied by a truck based business which doesn’t use their bulkheads, and some of the LaGuardia people’s plans for Dutch Kills are also being assisted by other area businesses. 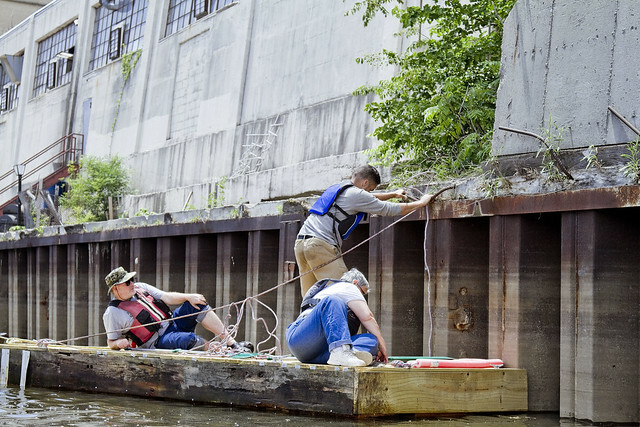 The HarborLab folks accomplished their mission, and began the unenviable task of securing the dock to a bulkhead with no anchored cleats to tie up to. Luckily, jagged bits of rebar were available. In tomorrow’s post, a few more views from the Turning Basin itself. And do fix that ‘Queensican’ typo while you’re at it, old boy. Folks in these parts refer to themselves as being from their respective townships (of which we are quite proud and have forced even the mighty U.S. Postal Service to accept) and I am not aware of any such Futurama-like cosmic being here able to exist over 109 square miles and reside in all townships simultaneously. Even the Pentacle Wizard should not invoke such a being.